Fit Momma of Four: Meal planning, the secret to my healthy success! Meal planning, the secret to my healthy success! It took me a long time to see the value of meal planning. I thought, why take the extra time to plan out my meals when I can just wing it & do just fine. Right? WRONG! Because when I wing it & leave my food to chance I leave too much room for laziness, cheats, and quick-fix junk. That is NOT going to help me reach my goals, it is not going to make my family healthy, & it's not going to teach my kids the healthy habits I want them to have in life. Now I make a meal plan every Sunday. But to me, it's more than just a meal plan, it's a plan for success! 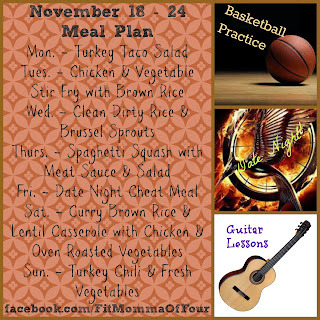 I keep all of our weekly activities & schedules in mind & then map out all of our meals & snacks to match our time constraints for the week. I then use my meal plan as a guide to my grocery shopping. I stick to the perimeter of the store - grabbing my fresh fruits & veggies, stocking up on the lean proteins, some eggs & almond milk from the dairy isle - avoiding all the highly process, chemical sh*t storm in the middle isles. When I get home I clean & prep veggies for easy snacking & place them at eye-level so they are the first thing we see when we open the fridge. So what does a clean eating meal plan look like? We eat 5-6 small meals/snacks each day, eating every 2 1/2 - 3 hours. I pair a lean protein with a complex carb (fruit or veggie) to keep my metabolism burning. Highly processed foods with lots of chemical junk that I can't pronounce is off limits. Starchy carbs are used sparingly & refined sugars are little to none. This healthy eating lifestyle is one that my entire family has been following for over a year now. It is sustainable, affordable, and makes us feel GREAT! Would you like more tips on how to make a meal plan or to learn more about clean eating? Drop me a line at jessicahrbek@gmail.com or find me on Facebook at www.facebook.com/FitMommaOfFour . I'd love to help your family start living a healthy lifestyle. Looking for some clean eating recipes? Click here to check out my family's favorites.